PEUGEOT 308 GEARBOX FOR SALE. THIS GEARBOX WILL FIT A PEUGEOT 308 HATCH. THIS GEARBOX WILL FIT MOST PEUGEOT 308S WITH THE 1.6L NON TURBO ENGINE. WE HAVE GEARBOX FOR MOST PEUGEOT MODELS BETWEEN 2000 AND 2010. SO EVEN IF THIS PARTICULAR GEARBOX DOESN’T EXACTLY MATCH YOUR PEUGEOT WE MAY HAVE ONE THAT DOES. ALL PARTS SOLD WILL BE DELIVERED TO YOUR DOOR WITHIN 3 WORKING DAYS AND COME WITH A 3-MONTH WARRANTY. VISIT PEUGEOTPARTS.COM.AU. 4 SPEED AUTOMATIC TRANSMISSION FOR A PEUGEOT 308 OR 308CC 2007 TO 2012 CAME OUT OF A WORKING CAR AND IS FULLY TESTED RUNS VERY WELL AND VERY SMOOTH CHANGES WITH NO KNOWN ISSUES WE OFFER 3 MONTHS GUARANTEE ON THIS ITEM WE ALSO OFFER FREE DELIVERT TO YOUR DOOR AUSTRALIA WIDE. VISIT PEUGEOTPARTS.COM.AU. 6 SPEED AUTOMATIC TRANSMISSION FOR A PEUGEOT 308 DIESEL.... FULLY TESTED AND IN GOOD WORKING ORDER NO ISSUES CHANGES VERY SMOOTHLY CAME OUT OF WORKING CAR WITH ONLY 177000 KMS WE OFFER 3 MONTHS GUARANTEE ON THIS UNIT WE ALSO OFFER FREE DELIVERY TO YOUR DOOR AUSTRALIA WIDE. VISIT PEUGEOTPARTS.COM.AU. •	AUTOMATIC TRANSMISSION FROM A 2009 PEUGEOT 308. •	CAME OUT OF THE 2.0 LITRE DIESEL MODEL AND HAS DONE LOW KMS OF 127000 •	WE HAVE TESTED AUTOMATIC AND IT WORKS WELL WITH NO ISSUES. •	ALL PARTS SOLD COME WITH 3-MONTH WARRANTY FREE DELIVERY AND A GUARANTEED FIT. VISIT PEUGEOTPARTS.COM.AU. •	COMPLETE TOWBAR AND FITTINGS TO BOLT STRAIGHT ON TO ANY PEUGEOT 406 SEDAN OR WAGON OR COUPE.... •	AS WE ARE WRECKING OVER 50 PEUGEOTS SO WE ALSO HAVE A RANGE OF OTHER PARTS AVAILABLE. •	ALL PARTS SOLD COME WITH 3-MONTH WARRANTY FREE DELIVERY AND A GUARANTEED FIT. VISIT PEUGEOTPARTS.COM.AU. DIESEL PARTICLE FILTER FOR A 2008 PEUGEOT 307 2.0 LITRE- AS WE ARE WRECKING OVER 50 PEUGEOTS SO WE HAVE THIS PART AVAILABLE FOR ALL MODELS BETWEEN 2000 AND 2010.- ALL PARTS SOLD COME WITH 3-MONTH WARRANTY FREE DELIVERY AND A GUARANTEED FIT. VISIT PEUGEOTPARTS.COM.AU. PEUGEOT 407 GEARBOX FOR SALE. THIS GEARBOX WILL FIT A PEUGEOT 407 WAGON. GEARBOX IS IN VERY GOOD CONDITION. IT HAS BEEN FULLY TESTED AND CHANGES GEARS VERY SMOOTHLY. WE HAVE GEARBOX FOR MOST PEUGEOT MODELS BETWEEN 2000 AND 2010. SO EVEN IF THIS PARTICULAR GEARBOX DOESN’T EXACTLY MATCH YOUR PEUGEOT WE MAY HAVE ONE THAT DOES. ALL PARTS SOLD WILL BE DELIVERED TO YOUR DOOR WITHIN 3 WORKING DAYS AND COME WITH A 3-MONTH WARRANTY. VISIT PEUGEOTPARTS.COM.AU. 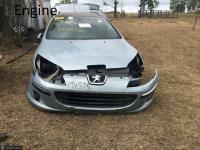 PEUGEOT 407 ENGINE FOR SALE. THIS ENGINE WILL FIT A PEUGEOT 407 WAGON. VERY RARE 2.2L ENGINE FOR SALE. WILL SELL VERY QUICKLY AT CURRENT PRICE. IN GOOD CONDITION. WE HAVE ENGINES FOR MOST PEUGEOT MODELS BETWEEN 2000 AND 2010. SO EVEN IF THIS PARTICULAR ENGINE DOESN’T EXACTLY MATCH YOUR PEUGEOT WE MAY HAVE ONE THAT DOES. ALL PARTS SOLD WILL BE DELIVERED TO YOUR DOOR WITHIN 3 WORKING DAYS AND COME WITH A 3-MONTH WARRANTY. VISIT PEUGEOTPARTS.COM.AU. 6 SPEED AUTOMATIC TRANSMISSION FOR PEUGEOT 407 V6 DIESEL THIS AUTOMATIC CAME OUT OF A WORKING CAR WITH LOW 131233 KMS AND HAS BEEN FULLY TESTED AND CHCKED TRANSMISSION CHANGES THROUGH GEARS VERY SMOOTHLY AND HAS NO KNOWN ISSUES AT ALL WE OFFER A FULL 3 MONTH GUARANTEE ON THIS UNIT WE ALSO OFFER FREE DELIVERY TO YOUR DOOR AUSTRALIA WIDE. VISIT PEUGEOTPARTS.COM.AU. 4 SPEED AUTOMATIC TRANSMISSION FOR A PEUGEOT 206 OR A 206CC FROM 2001 TO 2007 AND FITS THE 1.6L PETROL ENGINE THIS AUTOMATIC CAME OUT OF A WORKING CAR AND IS WORKING WELL WITH NO FAULTS WE OFFER FULL 3 MONTHS GUARANTEE ON THIS UNIT ALSO COMES WITH FREE DELIVERY TO YOUR DOOR AUSTRALIA WIDE. VISIT PEUGEOTPARTS.COM.AU. 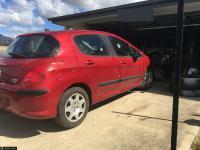 4 SPEED AUTOMATIC TRANSMISSION FOR PEUGEOT 207 TO SUIT 1.6 L ENGINE TRANSMISSION IS IN VERY GOOD CONDITION COMING OUT OF A WORKING CAR FULLY TESTED AND CHANGES THROUGH GEARS VERY SMOOTHLY WE OFFER 3 MONTHS GUARANTEE OR 20000 KILOMETRES WE ALSO OFFER FREE DELIVERY TO YOUR DOOR AUSTRALIA WIDE. VISIT PEUGEOTPARTS.COM.AU. 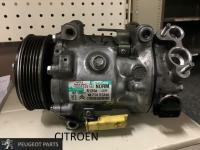 •	AUTOMATIC 4 SPEED TRANSMISSION FOR 1.6 LITRE ENGINE VERY GOOD CONDITION VERY SMOOTH LOW 112000 •	AS WE ARE WRECKING OVER 50 PEUGEOTS SO WE HAVE MANY GEARBOXES FOR A RANGE OF MODELS •	ALL PARTS SOLD COME WITH 3-MONTH WARRANTY FREE DELIVERY AND A GUARANTEED FIT. VISIT PEUGEOTPARTS.COM.AU. •	AUTOMATIC TRANSMISSION FROM A 2007 PEUGEOT 407 2.7 LITRE V6 DIESEL SEDAN •	THIS TRANSMISSION CAME OUT OF A WORKING CAR AND WAS FULLY TESTED BEFORE REMOVAL •	ALL PARTS SOLD COME WITH 3-MONTH WARRANTY FREE DELIVERY AND A GUARANTEED FIT. VISIT PEUGEOTPARTS.COM.AU. •	RADIATOR OUT OF A PEUGEOT 307 HATCHBACK •	RADIATOR SUITS THE POPULAR 1.6 LITRE PETROL ENGINE AND CAME OUT OF A LOW KILOMETRE CAR •	ALL PARTS SOLD COME WITH 3-MONTH WARRANTY FREE DELIVERY AND A GUARANTEED FIT. VISIT PEUGEOTPARTS.COM.AU. 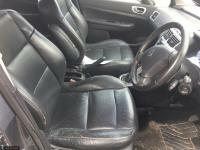 PEUGEOT 307 LEATHER SEATS FOR SALE. THIS LEATHER SEATS WILL FIT A PEUGEOT 307 WAGON. THIS INCLUDED THE DRIVER’S SEAT THE PASSENGERS SEAT AND THE REAR SEAT (3 SEATER). WE HAVE LEATHER SEATS FOR MOST PEUGEOT MODELS BETWEEN 2000 AND 2010. SO EVEN IF THIS PARTICULAR LEATHER SEATS DOESN’T EXACTLY MATCH YOUR PEUGEOT WE MAY HAVE ONE THAT DOES. ALL PARTS SOLD WILL BE DELIVERED TO YOUR DOOR WITHIN 3 WORKING DAYS AND COME WITH A 3-MONTH WARRANTY. VISIT PEUGEOTPARTS.COM.AU. 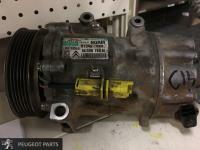 PEUGEOT 407 GEARBOX FOR SALE. THIS GEARBOX WILL FIT A PEUGEOT 407 SEDAN. THIS IS AN EXTREMELY RARE AND HARD TO COME BY GEARBOX. 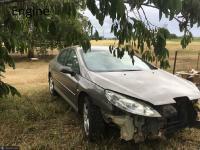 IT IS A 4 SPEED AUTOMATIC AND SUITABLE FOR A RANGE OF PEUGEOT 407. WE HAVE GEARBOX FOR MOST PEUGEOT MODELS BETWEEN 2000 AND 2010. SO EVEN IF THIS PARTICULAR GEARBOX DOESN’T EXACTLY MATCH YOUR PEUGEOT WE MAY HAVE ONE THAT DOES. ALL PARTS SOLD WILL BE DELIVERED TO YOUR DOOR WITHIN 3 WORKING DAYS AND COME WITH A 3-MONTH WARRANTY. 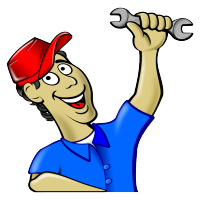 VISIT PEUGEOTPARTS.COM.AU. 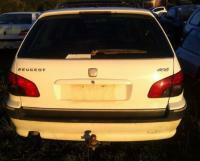 PEUGEOT 407 ENGINE FOR SALE. THIS ENGINE WILL FIT A PEUGEOT 407 SEDAN. THIS ENGINE HAD BOTH THE TIMING BELT AND THE WATER PUMP REPLACED ONLY 8000 KM AGO. OVERALL IN GOOD CONDITION AND STILL HAS PLENTY OF WEAR. THIS ENGINE HAS COME OUT OF A 2006 MODEL HOWEVER THE ENGINE WILL FIT OTHER YEAR MODELS. WE HAVE ENGINES FOR MOST PEUGEOT MODELS BETWEEN 2000 AND 2010. SO EVEN IF THIS PARTICULAR ENGINE DOESN’T EXACTLY MATCH YOUR PEUGEOT WE MAY HAVE ONE THAT DOES. VISIT PEUGEOTPARTS.COM.AU. CITROEN C6 FOR SALE. THIS WILL FIT A CITROEN C6 WITH THE 2.0L 4 CYLINDER DIESEL ENGINE. SUITABLE FOR YEAR MODELS BETWEEN 2006 AND 2014. ALSO FITS OTHER MODELS OF CITROEN AND PEUGEOT. 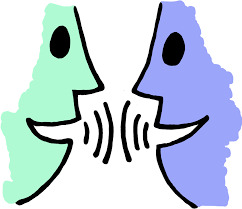 GIVE US A CALL TO SEE IF WE CAN HELP. WE HAVE S FOR MOST CITROEN MODELS BETWEEN 2000 AND 2010. SO EVEN IF THIS PARTICULAR DOESN’T EXACTLY MATCH YOUR CITROEN WE MAY HAVE ONE THAT DOES. ALL PARTS SOLD WILL BE DELIVERED TO YOUR DOOR WITHIN 3 WORKING DAYS AND COME WITH A 3-MONTH WARRANTY. VISIT PEUGEOTPARTS.COM.AU. CITROEN C5 FOR SALE. THIS WILL FIT A CITROEN C5 WITH THE 2.0L 4 CYLINDER DIESEL ENGINE. FITS CITROEN C5 DATED 2006 TO 2014. MAY ALSO FIT A PEUGEOT 308 AND CITROEN C6. CALL TO FIND OUT IF IT WILL FIT YOUR CAR. WE HAVE S FOR MOST CITROEN MODELS BETWEEN 2000 AND 2010. SO EVEN IF THIS PARTICULAR DOESN’T EXACTLY MATCH YOUR CITROEN WE MAY HAVE ONE THAT DOES. ALL PARTS SOLD WILL BE DELIVERED TO YOUR DOOR WITHIN 3 WORKING DAYS AND COME WITH A 3-MONTH WARRANTY. VISIT PEUGEOTPARTS.COM.AU. 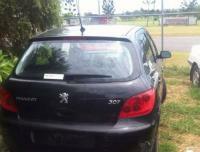 PEUGEOT 308 FOR SALE. THIS WILL FIT A PEUGEOT 308 WITH THE 2.0L 4 CYLINDER DIESEL ENGINE. FITS PEUGEOT 3008 BETWEEN 2006 AND 2014. ALSO FITS CITROENS C5 AND C6. CALL US TO FIND OUT IF IT WILL FIT YOUR CAR. WE HAVE S FOR MOST PEUGEOT MODELS BETWEEN 2000 AND 2010. SO EVEN IF THIS PARTICULAR DOESN’T EXACTLY MATCH YOUR PEUGEOT WE MAY HAVE ONE THAT DOES. ALL PARTS SOLD WILL BE DELIVERED TO YOUR DOOR WITHIN 3 WORKING DAYS AND COME WITH A 3-MONTH WARRANTY. VISIT PEUGEOTPARTS.COM.AU.